An awful lot of work goes into the NGV assembly and since it involves a lot of cutting, bending and welding of thin stainless steel parts, at each stage the stakes get higher. The penalty for a mistake is hours of work reduced to twisted scrap in a microsecond. But that's half the fun isn't it? Here's a shot of the inner and outer rings of the NGV. The curved blades have been inserted into slots cut in the inner ring using a jigsaw. After welding, the blades were very gently machined down in the lathe to fit the diameter of the outer ring. I left a little tag on each to locate into short slots cut into the outer ring. I discovered it's more than normally important to work slowly, tacking the parts together at opposite diameters and letting it cool after each weld to avoid the assembly distorting. The first time I made one of these I only just got away with it. The turbine housing (outer ring) finished so far out of round I amost didn't have enough thickness of metal to true it up. 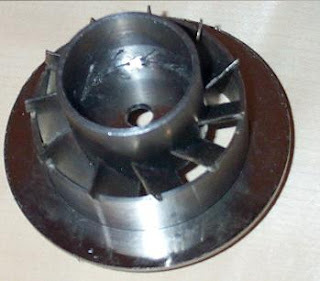 Since the turbine wheel itself is supposed to howl round in that bit of pipe with a clearance of just 1/4mm (10" thou.) It's vitally important for it to be absolutely round and concentric with the shaft tunnel support. This time, I checked the alignment in the lathe chuck after each tiny tack-weld. Very intricate work. I was browsing around looking for info on Stage 3 & 4 NGVs and stumbled upon your post. Thanks for the info. I am a non-techie, can you show a sketch where the NGVs go in the engine? NGVs are placed anywhere you want to direct gas flow - they're just guide vanes. In this case, just in front of the turbine. There are photos and drawings throughout the rest of the blog that should make it clear. Hye!..i want to ask you a several question regarding NGV in Gas Turbine Engine. 1 How can the effect of heat reduced on NGV and turbine blades? 2 Where is the location of NGV in Gas Turbine Engine? 3. Why is a convergent duct formed between the nozzle guide vanes? I'm Askray. Currently studying in aviation school in Malaysia. Hope you can give me the answer and I'm very please if we can exchange our thought on this.